PORT ISABEL — It’s all about family. David Gower reflected on the 45 years his family has participated in the Texas International Fishing Tournament. He was standing at the weigh station at Southpoint Marina yesterday afternoon, the bay water shimmering beneath the sunny skies. He remembered his first fishing tournament when he was 10 years old. He remembered six years later when he won the junior offshore fishing division after catching a blue marlin and eight yellow-fin tuna. But that’s not what keeps him coming back. “It’s just become a family tradition for us,” said Gower, one of the current executive directors. Anglers in the 79th TIFT had just begun arriving with their catches. “My daughter started fishing when she was two years old, so she’s been in it her whole life,” said Gower, 55. It seems that way for a lot of families. His daughter Jenny, 19, is the hostess for this year’s tournament. She posed nearby with youngsters holding up their catches. She’s always enjoyed the experience, but one thing is a little tiresome. “Getting up at 5:30 in the morning and out all day long, but I always enjoy it,” she said. 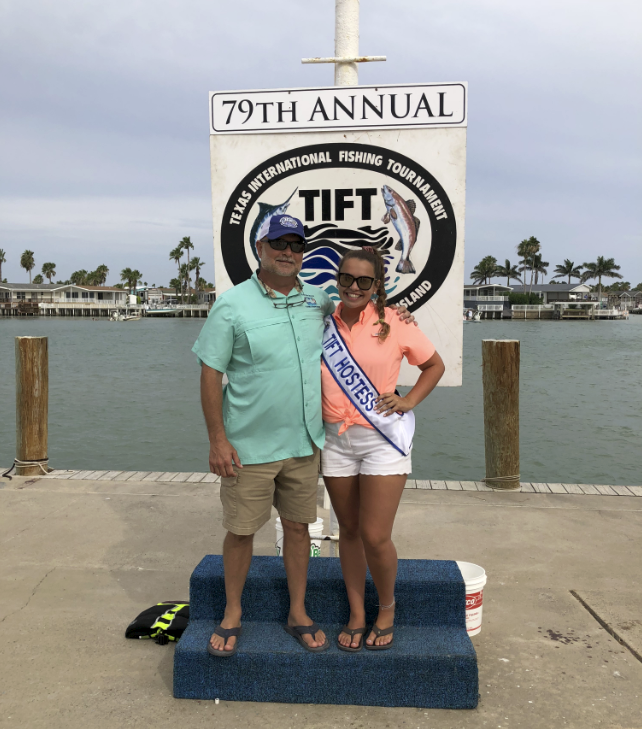 Jenny remembered winning the junior bay division when she was 16 with a total catch of redfish and trout. She’s not the first in her family to serve as hostess, said Gower. He watched now with a smile as Jenny posed before the camera with 2-year-old Adelyn Carlisle, who held up a load of fish.